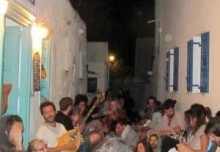 The title of this article could be «Amorgos on the rocks». If it’s not «Martini on the rocks», we are nevertheless dealing with rocks on Amorgos and it’s on the rocks that you discover the island and it’s numerous hiking opportunities. Odos Seladiou is not one of the main streets of Tholaria. At a short distance from the animated village, this path is worth the detour. There you will find one of the nicest bars of the island. This is were Iorghia, originally from Thessaloniki, stretched out her golden hand, restored an old village building and opened her coffee-bar «Seladi» in july 2010. The small building offers a charming courtyard and an amazing view on the village of Langada and the Aegiali bay. At night Langada brightens up like a constellation and inspires fertile imagination as to what you see : a dolphin, an otter, a scorpion or a crab. Iorghia and her crew are most welcoming, cheerful and relaxed. 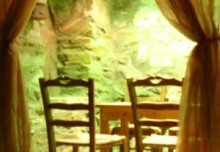 Some others coffee-bars we enjoyed were «Amorgialos» on the port of Aegiali and “Jazzmin” in the main town, Chora. As you leave the Seladi Bar you hit the dirt road to the mountain. The most courageous will pursue until the bed&breakfast of Wendula. This is where we stayed and enjoyed amorgian bohemia for 10 days. Here, no air conditionning, no television, no backround music around a pool, as there is no pool. Here you don’t spend time waving bathtowels from shower to shower as it is clearly pointed out not to waste water because the autonomy of the house depends on rainwater. Here, silence is deeper than silence and at night the sky brightens up in a profusion of stars. Here you are not compelled to have breakfast between 8am and 10am. Wendula adapts to the needs of each and every one. Brunch after a swim or lunch after a longer walk, anything is possible, even a dinner under the stars, cooked by a Belgian guest who boarded the same time as we did. Wendula has planted a vineyard from which she plans to make wine from in three years. Meanwhile we emptied joyfully bottles which came from an other production. Faithful to Amorgos since 20 years, Wendula built her house 10 years ago and settled in with her cats and dogs. Watch her stride around the village, saluting and being saluted, and you will understand that she has been adopted by the community. You will have understood that her vivid personality created a home at her image with a warm, bohemian, unconventional touch. Nature, peace and freedom lovers as well as hikers will feel at home. Hikers and occasional walkers: don’t miss out on the thousands of walking opportunities. Not even the summer heat must put you off. Just leave early. With some willpower you will tear yourself out of your sheets, your head following with reluctance, still suffering the consequences of a heavy night. Don’t forget water, biscuits, sun cream, the map of Amorgos and a good pair of shoes. The main paths are easy. Check the website www.cyclade.be. 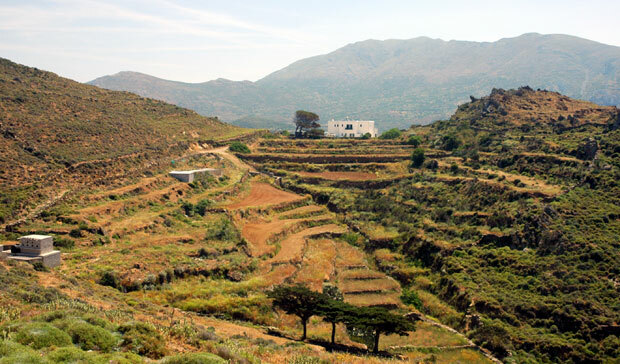 It gives valuable information on the hiking options which will make you discover the many faces of Amorgos. These paths are well maintained and one can often encounter farmers passing on their donkeys. All your senses will be put to the test. Sage bushes reminding you the smell of incense burning in the orthodox chapels, sweet figs picked on the way, melting on your tongue, vertigo on the mountain cliffs dropping into the sea, the touch of a donkey or a soft cat you encounter on the path, the immaculate white chapels peeping like bright eyes in the green « holy-oak » vegetation or contrasting with the burnt hills. These are some of the walks we did: From Tholaria to Langada, to the Chapel of Stavros, passing the Monastery of Agios Theologos. Magnificient, unforgettable . Green valleys, cliffs falling into the sea. Not suitable for people suffering of from vertigo. From Katapola to the chapel of Agios Valsamitis. There, in the hight of summer, after an hour’s walk, we came across a brook with frogs and dragonflies. Most of the nicest beaches are accessible by foot. You will find deserted creeks, or nearly, where bathers dress or undress without shame. Study the map of the island and don’t fear to be adventurous. Your curiosity will be satisfied. Here you will find a number of beautiful pictures of Amorgos. Please, feel free to send us your impressions of the island, too!